The power law model in RGA is used to analyze system level failure data of fielded systems. Examination of the parameter β can help the analyst to determine if the system is exhibiting infant mortality (β < 1), constant failure intensity (β = 1) or wearout (β > 1). If the system is exhibiting wearout, then failures happen closer together in time as the system ages. Consequently, the associated maintenance costs will increase over time. One strategy for reducing system maintenance costs is to perform an overhaul of the system. This article discusses the theory behind determining an optimum overhaul time and presents a practical example of the calculation in RGA. First, consider the case where the system does not undergo an overhaul. The system maintenance cost per unit time, CPUT, at a given time, t, will be the sum of the cost per unit time of unplanned maintenance and the cost per unit time of scheduled maintenance. β and λ are the parameters of the power law model. S is the time interval between planned maintenance actions. C1 is the average cost of an unplanned maintenance action. C3 is the average cost of a planned maintenance action. Since λ , S , C1 and C3 are all greater than zero and β is greater than one, CPUTSystem,No Overhaul always increases as time increases. Now consider the case where the system is overhauled at times T, 2T, 3T, and so on. The overhaul is assumed to restore the system to an as good as new condition. The system maintenance cost for a single overhaul cycle, COverhaul Cycle, is the sum of the costs of unplanned maintenance, planned maintenance and an overhaul. where C2 is the cost of a system overhaul. 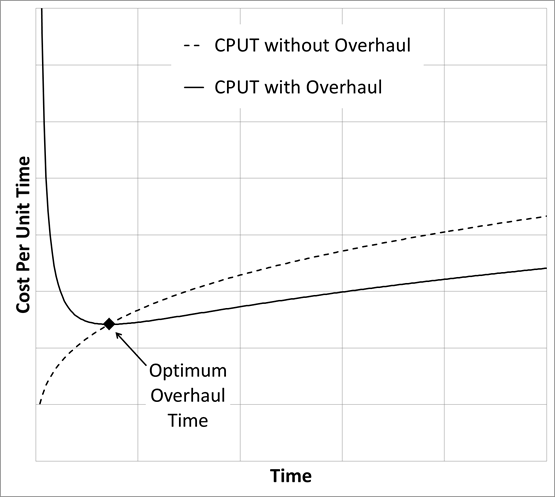 To obtain an expression for the average system maintenance cost per unit time, the previous expression is divided by the overhaul cycle length, T.
The cost of an overhaul is typically much larger than the cost of an unplanned or planned maintenance. Therefore, when the overhaul time is short, the last term in the expression dominates and the cost per unit time decreases as overhaul time increases. When the overhaul time is long, the first term dominates and the cost per unit time increases as overhaul time increases. The expressions for the cost per unit time for the system with and without overhaul are plotted generically below. Note that the cost of planned maintenance and the time interval between planned maintenance actions cancel and do not appear in the formula for the optimum overhaul time. As a practical example, consider the case of three systems with a start time of 0, an end time of 10,000 hours and the failure data shown next. Using the Power Law model, the estimated parameters for this data set are β = 1.4738 and λ = 2.1211E-5. Since the value of β is greater than one, overhauling this system could be a good maintenance strategy. If the cost of an overhaul is $1,000,000 and the average cost of an unplanned maintenance action is $100,000, then the optimum overhaul time is about 11,700 hours, as shown next. The cost per unit time (ignoring planned maintenance actions) is expected to be $265/hour as shown in the calculation below. When analyzing complex repairable systems, it is not reasonable to assume that maintenance actions return the system to an as good as new state. The power law model that is used to predict cumulative number of failures assumes that there is minimal repair when maintenance is performed. Therefore, maintenance cost per unit time will continue to increase for the life of the system when the power law model parameter beta is greater than one. 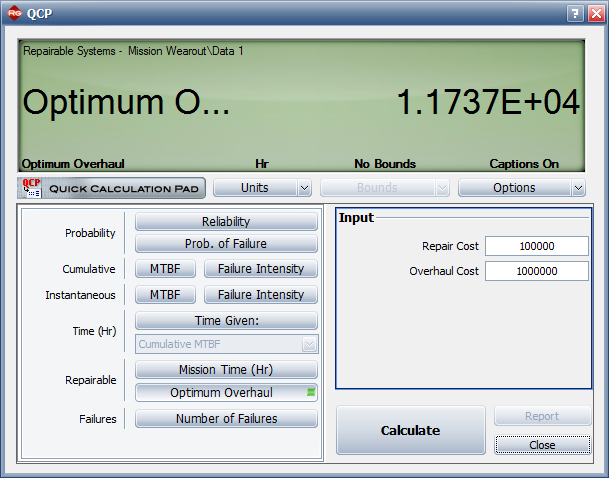 This article addresses system overhaul, a method of restoring the system to an as good as new state, and shows the calculations involved in minimizing maintenance cost per unit time by optimizing the time between overhauls.